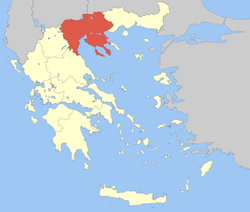 The region was established in the 1987 administrative reform as the Central Macedonia Region (Greek: Περιφέρεια Κεντρικής Μακεδονίας, translit. Periféria Kentrikís Makedonías). With the 2010 Kallikratis plan, its powers and authority were redefined and extended. Along with East Macedonia and Thrace, it is supervised by the Decentralized Administration of Macedonia and Thrace, based in Thessaloniki. The region is based at its capital city of Thessaloniki and is divided into seven regional units (pre-Kallikratis prefectures), Chalkidiki, Imathia, Kilkis, Pella, Pieria, Serres and Thessaloniki. These are further subdivided into 38 municipalities. Central Macedonia is Greece's most visited region and accounts for 18.2% of the total tourist flow in the country, with 3.21 million tourists in 2008. In 2011, the GDP per capita of Central Macedonia was €14,400, marking a 9th place of the 13 regions of Greece, well below the national average of €18,500. ^ "Demographic and social characteristics of the Resident Population of Greece according to the 2011 Population - Housing Census revision of 20/3/2014" (PDF). Hellenic Statistical Authority. 12 September 2014. Archived from the original (PDF) on 2015-09-08. Retrieved 2015-04-03. ^ a b "Gross domestic product (GDP) at current market prices at NUTS level 2". Eurostat regional yearbook. Eurostat. Retrieved 3 April 2015. ^ Eurostat (2010). "Tourism" (PDF). Eurostat regional yearbook 2010. www.eurosta.eu. Archived from the original (PDF) on 16 May 2011. Retrieved 16 April 2011.